More than 250 youths from 29 teams participated in the HI-PAL “Click It or Ticket” elementary and intermediate basketball leagues, which ran from February through April with games at Andrews Gym, Carvalho Park and Pāpaʻikou Gym. Waiākea Titans Gold and Keaʻau Green both finished the intermediate league with unblemished 8-0 records. 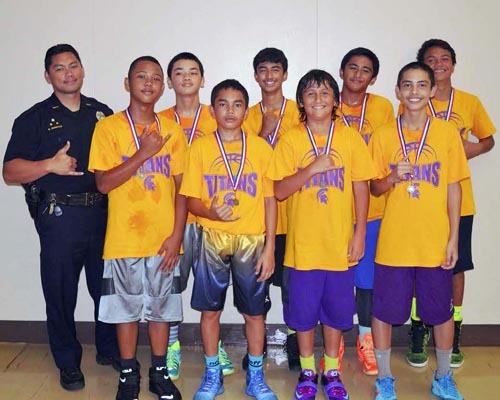 Waiākea Titans Gold also claimed both the pre-season and post-season goodwill tournament championships. Members of Titans Gold included Kiaʻi Apele, Mikey Bugado, Kilohana Haasenritter, Kawai Kiko, Shesley Martines, Magnus Namohala-Roloos, Guyson Ogata and Rekki Prudencio. In the elementary division, Keaʻau claimed the pre-season tournament championship, and the Waiakea Titans won the post-season tournament. Members of Keaʻau included Rockie Abadilla, Steel Abadilla, Jazelle Dorser, Justis Dorser, Bryanna Ganir, Owen Hernando, Jett Mantz, Josiah Ramones, Kobe Tabuyo-Kahele and Paea Taliauli. Members of the Waiākea Titans included Zayre Fuiava, Kamalu Haleamau, Glendon Ogata, Jayke Prudencio, Trace Tengan and Braedy Yamada. The goal of the league is to provide youth with a positive activity during the latch-key hours of 3-7 p.m. as an alternative to harmful activities. League participants are required to play for their school team. Any school wishing to participate in the league next season may call the HI-PAL office at 961-2350.